Strikingly Recenze 2019 - Proč 4.5 hvězdiček? Strikingly has a lot of good things going for it. The intuitive drag and drop editor does take the hassle out of building your website and the responsive templates are by far some of the best. Strikingly has established itself as a leader in the one-page site builder niche and the results are promising. The last couple of years have seen an increase in the popularity of one-page websites. These sites are typically long, minimalist, and feature large images. Most site builders on the market today are designed to create multi-page websites—they do not make it easy to build a one-page website. But Strikingly does just that. Strikingly features an intuitive editor that lets you create sections that can be scrolled up and down as one page. You will get the hang of it quickly even if this is your first website. Available themes have a contemporary feel and can be slightly customized to your preference. Start-ups and freelancers will get the most out of these designs. Admittedly, there is not much in the way of robust features as you would find in Wix, Duda, or Weebly, but Strikingly does get the job done if you are looking for a light eCommerce, personal, or small business website. One thing to note is that once you create your website with Strikingly, you cannot export it to a different hosting provider. 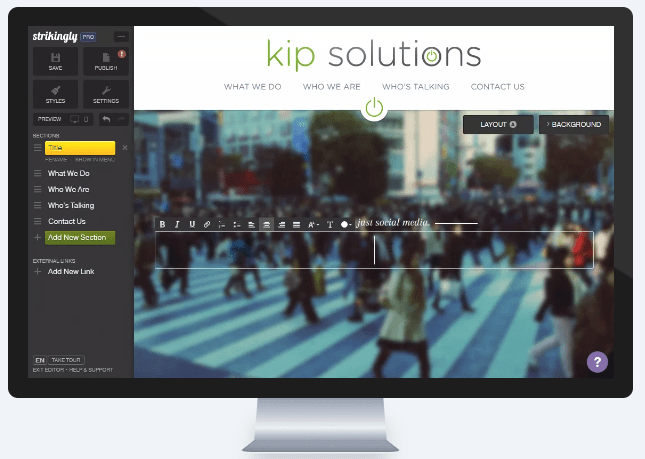 Beautiful, Responsive Templates Everywhere You Look. Eye-catching themes: There are about 25 themes to choose from, most of which are slick and will effortlessly give your website a professional look. The themes are arguably more varied than those offered by other site builders, and you can choose designs based on whether you want a personal, business, or a portfolio site. Customization: Unfortunately, Strikingly does not offer any significant opportunities for customization. As it stands, you can only change your website to one colour, and that is if you are on the Pro plan. Contrary to other site builders that allow basic customization, Strikingly will not let you change simple things like border colours, background images, fonts, font sizes, or even font colours. Responsive: On the upside, all themes are responsive and will display well on mobile devices. One-page websites are especially adept to mobile—they load faster, and touch-friendly menus help you navigate between sections seamlessly. One issue to note, however, is that with Strikingly’s mobile sites, it’s not possible for customers to click on your phone number to call or to send an email unless you build your website on one of the paid accounts. Tools That Help You Make an Impression Online. 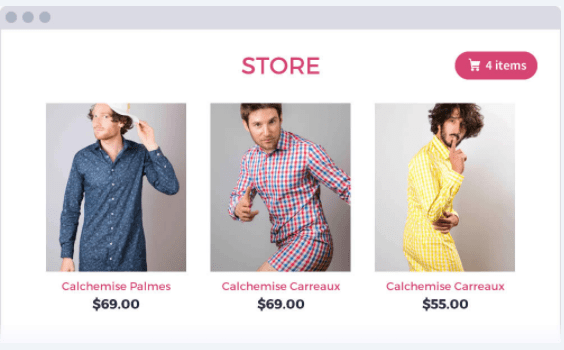 eCommerce: To start selling on your Strikingly site, just install the Simple Store widget, connect with PayPal or Stripe, and you are good to go. As the name suggests, you can only set up a lightweight one-page web store to sell just a few products. Upgrading to a Pro account lets you set up coupons and automatic email notifications to your customers, embed Ecwid web stores with all their features, adjust shipping options, and set product variations. Unfortunately, there is not much you can do in the way of customizing your eCommerce store and neither can you sell digital downloads. Blog: The way the blog section is organized is quite different from how it is with conventional site builders. Instead of entire posts, the blog section shows links that take you to individual pages. These individual pages have a different design from your overall theme—this is only a minor intricacy—otherwise, the blog comes with all the other basic features, including saving drafts and enabling comments. Site analytics: Strikingly websites come with inbuilt site stats in line with many of its popular competitors. Clicking on the Analytics button at the Settings window reveals essential metrics such as the number of unique site visitors, mobile site usage, type of browser used to access your site, and origin of traffic including visitors’ countries. Get Up and Get Going with Just a Few Clicks. Getting started with Strikingly is incredibly easy—either fill in the super-short sign up form or use the available Facebook button to automatically fill in the signup form with your information. You can get started designing your website on the free plan without providing your credit card information. Once you choose a template, no more time is wasted, and you can start building your site immediately. A particularly neat feature is the One-Click Website option, which makes it possible to build your personal website in a matter of minutes by importing information directly from your LinkedIn account. You will still have all the tools at your disposal to customize your personal website. No Coding, Perfect for Beginners. Strikingly’s intuitive drag and drop editor is easy to use. If you’ve built a website with conventional site builders before, you might have a little learning to do to understand the basics of Strikingly, but you will get up to speed with it quickly. The editor lets you easily create sections and add items including text and images to each section. No coding knowledge is required, but you can access the site’s HTML/CSS editor to customize your website’s header and footer. Help is Available Anytime You Need It. You won’t find a live chat option or phone support. What you will find instead is a “Happiness Team” that seems committed enough to—your happiness. You can reach this support team via email and from my own experience, they respond within less than 12 hours, which seems reasonable. Want to learn more about the most important aspects of this site builder? Peruse the comprehensive knowledgebase that offers access to a search box, in-depth videos, guides, and help articles. You will also find an Idea Forum where other users share their hacks for making the most of Strikingly’s features, which can come in handy as you build your own site. Strikingly has three pricing plans categorized into the Free, Pro, and Limited accounts. You can keep the free account forever if you do not want to upgrade to any of the paid plans. Here, you will get a branded domain, unlimited free sites, 5 GB bandwidth per month, an eCommerce store where you can sell one product per site, and round-the-clock support. Lastly, the Limited option offers you a custom domain, two limited sites, unlimited free sites, 50 GB bandwidth per month, an eCommerce store that supports up to 5 products, and access to 24/7 support. Strikingly offers a 14-day free trial with yearly billing being significantly cheaper than the monthly option. Strikingly has a lot of good things going for it. In many ways, it is a different site builder from what’s largely available on the market as it lets you design professional and seamless one-pagers. The intuitive drag and drop editor does take the hassle out of building your website and the responsive templates are by far some of the best. Compared to competitors such as Wix or Squarespace, Strikingly does not have any extraordinary features to brag about. The basic eCommerce function, blog, social media integration, and site analytics do however play their role rather well to create a functional website. One-page sites can complicate SEO and are typically limited in the number of applications they can support, but Strikingly is an excellent choice for anyone looking to design a seamless, responsive, and professional one-page website. Přemýšlíte, jak si Strikingly vede v porovnání s dalšími nástroji? Zadejte jakýkoliv jiný nástroj pro tvorbu webů a my vám je mezi sebou porovnáme.